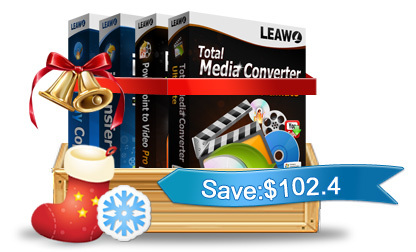 Leawo All-in-One Xmas Gift Pack includes Total Media Converter Ultimate, Blu-ray Copy, PowerPoint to Video Converter Pro and iTransfer. This All-in-one pack can help you to convert any Blu-ray/DVD/Video to various formats, Create any videos to Blu-ray/DVD, Copy Blu-ray/DVD discs, transfer media files to your iDevices without iTunes, even deals well with PowerPoint conversion. Leawo Total Media Converter Ultimate can perfectly convert between all common video/HD video/audio formats, e.g. AVI, MP4, WMV, AVCHD, FLV, RMVB, MPEG, MP3; convert AACS and BD+ Blu-ray discs; convert various DVD formats, e.g. DVD-5, DVD-9, CSS-DVD; create high quality DVD and recordable Blu-ray discs with wide selection of menu templates, background pictures and music; and accelerate online flash video playback and downloading process. Leawo Total Media Converter Ultimate also presents flexible video importing ways from file or folder, codec parameter settings, powerful video editing features, CPU core controls and profile quick search, external subtitle importing and so on to meet the higher video processing demands for advanced users. Leawo Blu-ray Copy is a one-click smart tool for Blu-ray HD video fans to copy Blu-ray disc and backup Blu-ray on hard disk or DVD discs. It incorporates advanced replication technology that allows you to copy Blu ray disc from various origins to the formats of DVD-5/9, file folder, ISO image and even 1:1 disc duplication for storage. It could also copy BD50 to BD25 or DVD-9 to DVD-5 without quality loss. Leawo Blu-ray Copy can successfully decrypt the most popular Blu-ray and DVD discs nowadays and copy Blu-ray DVD to DVD or hard disk. It is able to remove different copy protections of your commercial Blu-ray discs with AACS, BD+ to copy Blu ray, and copy DVDs with CSS protection as well. Besides, it could also act as a Blu-ray to DVD converter that could copy Blu-ray to DVD. Newly added features like selecting the copy mode from full, main and custom; adding subtitle and setting audio; previewing the source video, etc will definitely provide more options and convenience for you to store your Blu-ray DVDs in multiple destinations. Leawo PowerPoint to Video Converter Pro is a wonderful PowerPoint to video conversion program that assists in converting your PowerPoint presentations and slideshows to quality videos for uploading to video-sharing websites like YouTube and playing on portable devices like iPad, iPod and iPhone, while retaining all the animations, slide transitions, sounds and video clips in the source PowerPoint. Leawo PowerPoint to Video Converter Pro offers an innovative way for you to deliver anything made in PowerPoint, from Math homework to Makeup ads, from courseware to church sermons, fast and faithfully to the recipients via a video-welcome site. Leawo iTransfer is a powerful combination of iPod transfer, iPhone transfer and iPad transfer which can successfully transfer media files among all iOS devices, back up to PC and iTunes, shift from iTunes and PC library to iOS devices, manage media sources without iTunes. It is capable of fulfilling data sharing on various Apple products through devices transferring, guaranteeing data security by means of copying iPod to computer, iPhone to computer and iPad to computer, managing files as perfect as iTunes. You are enabled to transfer and copy all supported file types: music audios, movie videos, TV shows, phone ringtones, photos and other media files. All these multimedia sources can be easily transferred among Apple devices, iTunes and PC: iPod to iPod/iPhone/iPad/iTunes/PC, iPhone to iPhone/iPod/iPad/iTunes/PC, iPad to iPad/iPod/iPhone/iTunes/PC, PC/iTunes to iPod/iPhone/iPad, etc. Without iTunes synchronization, you can achieve extensive data sharing and data storing. In addition, other powerful features are attached to this iTransfer: the smart file filter facilitates file archive selection which makes it an intelligent transfer; the direct drag-and-drop and intuitive interface make it an easy-to-use iPod transfer to backup, transfer, and share media resources. No separate trial version is available for Leawo All-in-One Xmas Gift Pack. You can download trials of individual components. Leawo All-in-One Xmas Gift Pack costs 204.8 USD and can be purchased using This Link. Use coupon Code: LXMASBD50 or use This Link to purchase.